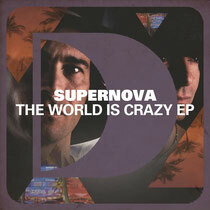 The first release of 2013 for Italian duo, Supernova, marks a shift to darker production territories. Whilst the two-track EP retains much of their signature grooves and hooks, the ‘World Is Crazy’ cut in particular experiments with darker and deeper sounds. The hard-hitting perpetual low-end throb and simple percussive ascension which drive with vigorous intent through to the warped vocal loop are a good accompaniment to the track’s lyrics. ‘The Bridge’ is an equally uncompromising cut, but with its fusion of early-90s whoops and vocal samples, there should be enough pumped up attitude for any peak time party vibes. It’s a good EP, out Monday February 25 on Defected Records, check it out below.